TL; DR: A pioneer in accelerated graphics processing, NVIDIA products exist on the leading edge of modern computing needs. Known for inventing the GPU popular in gaming, the NVIDIA team expanded their technology to virtual reality, artificial intelligence, and self-driving cars. They even created a first-of-its-kind virtualization platform that extends the power of their GPUs even further. The graphics-accelerated virtual environments powered by GRID centralize apps and data while delivering the right performance and security to each user. NVIDIA Vice President of Product John Fanelli recently told us about an architectural firm that installed GRID, the tech giant’s graphics virtualization platform, on virtual workstations so the architects could create 3D models and graphics. Virtualizing the workstations was so successful, the firm’s IT person decided to set up a similar infrastructure for the office workers. The virtual desktop interface didn’t include a GPU because the office workers wouldn’t use the intense graphics programs. 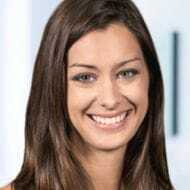 Without a GPU supporting Microsoft Office 365, however, employees struggled with lagging performance that threw off the cadence of data entry. “Without a GPU accelerating Excel, they were impacting the productivity of the most basic office worker functionality,” John said. The company quickly moved the business unit to GRID-enabled virtual desktops, which alleviated the problem. John Fanelli and the GRID team deliver GPU power to virtual workstations, desktops, and applications. From Office 2016 to Adobe Creative Suite and even web browsers, modern applications are driving a growing need for computing power. The ground-breaking NVIDIA GRID extends GPU technology to graphics-accelerated virtual machines and applications for improved security, performance, and productivity. NVIDIA invented the GPU in 1999. With thousands of cores and parallel processing capabilities, GPUs more efficiently process large blocks of data. Serving some the most demanding computing industries — and more recently, bringing virtualized GPUs to business desktop users — NVIDIA earnings top $5 billion annually. Companies needing high levels of computing power for deep learning or big data, for example, have long turned to NVIDIA’s Tesla platform. However, increasing numbers of applications and operating systems like Windows 10 are expanding the demand for performance and graphics accelerators to consumer-level users. GRID software is the first to allow teams to virtualize and distribute NVIDIA datacenter GPUs across multiple virtual machines and applications. The graphics-accelerated datacenter or cloud works on any device, from any location. By centralizing applications and data in the Cloud, virtual workspaces offer companies improved security, productivity, and mobility. Virtual workstations for professional visualization users speed up collaboration on massive files, while office workers appreciate the improved user experience on virtual desktops that are optimized for Windows 10 and productivity programs. 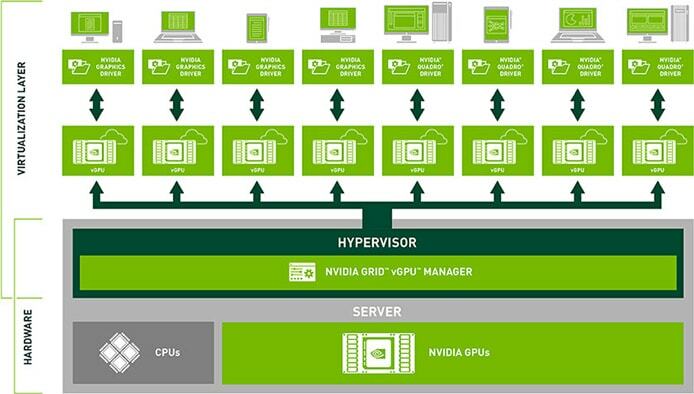 NVIDIA GRID is the first platform to virtualize GPUs and distribute accelerated virtual environments. With the release of GRID 2.0 in 2015, NVIDIA separated the software from the GPU hardware so their engineers could innovate in both technologies independently. “We can introduce new hardware boards that take advantage of your current software, and we can introduce new software that adds capabilities to your current hardware,” John said. NVIDIA produces different GPU boards to cater to the number of users and computing resources required. Each Tesla M10, geared toward business users, contains four GPUs and can support 64 users. According to John, most customers put two M10s in a server to cross the magical 100-users-per-server threshold. At the higher end, the Tesla M60 powers high-performance visualization applications. “We deliver the right power for the right application at the right price point,” John said. With each release, GRID finds more ways to step on the gas pedal. The GRID April 2016 release enabled hardware encoding to be moved from CPUs to the NVIDIA GPUs, improving user density by 30% and reducing latency by 30 to 50 milliseconds. The August 2016 release of GRID 4.0 introduced management and monitoring APIs. “The more users you have, the more important it is to make sure you keep the machines up and operational,” John said. GRID comes in three separate packages: virtual workstations for professional graphics needs, virtual PCs for an accelerated consumer-level experience, and virtual applications for deploying remote desktop session hosts or other Windows applications. Twice-annual software updates mean GRID customers quickly see returns on their investment, John said. John couldn’t reveal the updates GRID customers can expect in 2017, but he predicted an increased movement to cloud computing and new use cases for GRID. As Windows 10 gains traction and more modern applications are deployed, he said he expects to see additional management capabilities and Tesla GPUs with higher user densities. Even though NVIDIA runs a distributed team of thousands of engineers, John is impressed with the collaboration and excitement for GRID across the separate teams that put together the components for virtualization, application compatibility, and hardware encoding.